Two-Tone anti slip Slipper Socks for women give you the comfort of our originals with a modernized look. Ultra-soft polyester chenille with skid resistant treads for adults. 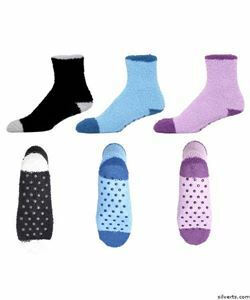 This 3 Pack of nonskid socks has one pair each of: Blue, Violet & Black. Irresistible skid and slip resistant hospital socks with treads or grips(rubber gripper socks)! Skid-resistant and slip-resistant slipper sock treads for safer wheelchair transfer. These womens non slip footwear slipper socks are terrific for adult patients in hospitals, post surgery, nursing homes and retirement homes. Non-skid socks are great for comfortable casual use in the home and for home care settings. Concerned about slipping socks on tile or hardwood floors skid socks with grips make the best choice in selecting a sock for at home use. These warm fuzzy comfort socks with grips by Silvert are made with acrylic and stretch yarns. Machine washable for convenience. 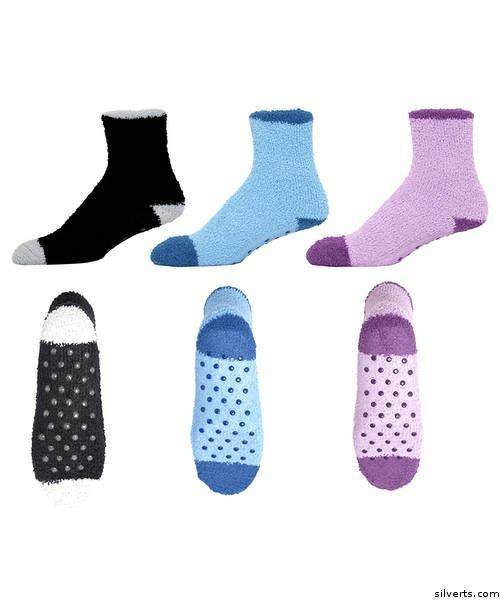 These non slip resistant slipper socks for women and non slip resistant slipper socks for men are used as lounge socks, tread socks and sleep socks because they are so comfortable. These non slippery gripper bed socks for women are a welcome gift for hospital and home care settings!